CJ Verdell and (almost) instant karma. Jacob Capra who, after replacing the injured Dallas Warmack, recovered from a brutal holding penalty in OT to pave the way for CJ’s winning TD. 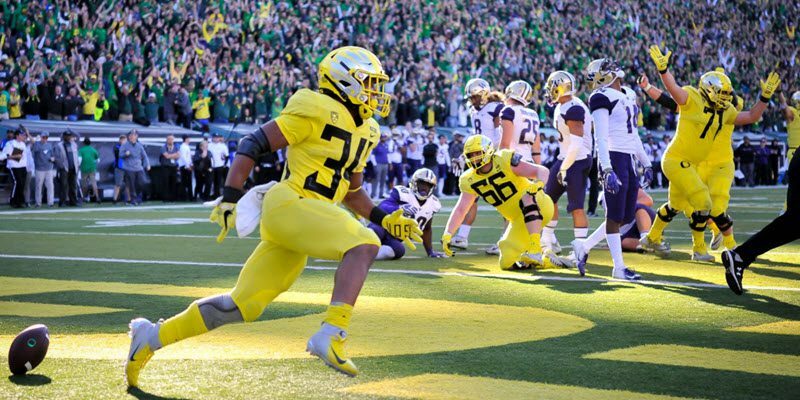 The Ducks Defense; especially, for holding UW to an OT field goal after the Huskies had 1st and goal. 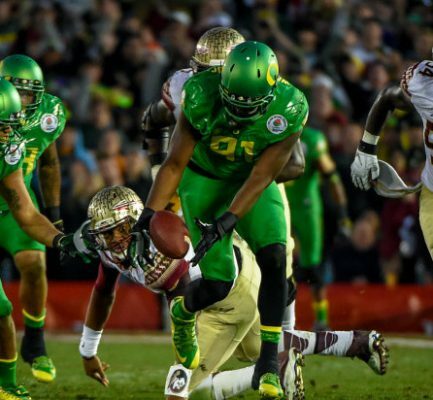 Coach Cris et al for sticking to a conservative game plan on offense despite the angst of many the Duck’s fans. And for bringing his Left Coast Smash Mouth System closer to fruition. Jaylon Redd barely in-bounds for a TD. Justin Herbert for playing within the game plan against a bunch of stellar college football (CFB) defensive backs and while rolling to his left and under pressure throwing a critical TD pass just before halftime. To CFB for the one-foot in-bounds reception rule. The Oregon O and D lines for playing through multiple injuries and winning both LOS. The Disney powers-that-be for defying Larry ‘Late Nite’ Scott and broadcasting a Duck’s game under the beautiful fall sunshine. For the well played savings of timeouts. Ducks Fans for bringing the Autzen Sonic Boom. I’m all out of hats but I do have a question for Late Nite Larry and his punctilious Pac 12 referees: Is a Husky capable of holding? But is a chase for the Cotton Bowl or a March to Miami doable? As a Certified (and certifiable?) Greybeard, I hate with a passion having to elevate the Cotton and Orange Bowls above the Grand Daddy but this is what Tom Hansen and Late Nite Larry hath wrought. This is the result of ‘selling’ The Rose Bowl for fewer trinkets than Native American’s received for the sale of Manhattan. On the day after a Dawg-gone great CFB game, the ace of algorithms, Jeffrey Sagarin, tells us that Oregon’s Strength of Schedule (SOS) comes in at 111 out of 254 ranked teams. (I find it somewhat ironic that Drake is the anchor team.) And the boys and girls in Bristol tell us that the Ducks has a remaining SOS of 51 out of the 130 ranked Power 5 and Group of 5 teams. 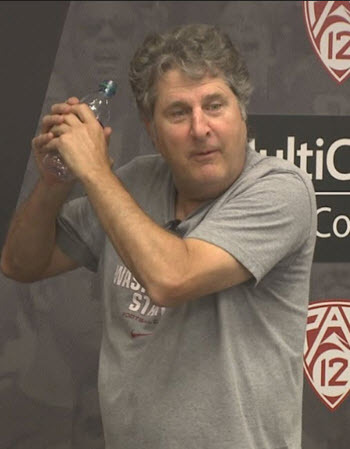 The Pirate of the Palouse, Mike Leach. Looking at this week’s AP Poll, all but No. 10 UCF at 118, has a better SOS than the Ducks and only the No. 4 Domers has a worse remaining SOS. And let’s face it; the G5 teams are only participant’s in theory in order to provide political cover for Bill ‘Ventriloquist Dummy’ Hancock and his buddies. And the Ducks chances have been undercut by the Trees having been chopped at the roots in its last two efforts after the Ducks snatched defeat from the jaws of victory. It also doesn’t help the team that husked the Huskies in week one, Auburn, just ended Tennessee’s 16 game SEC losing streak with a gag at home. Also, future opponent Utah is serially under-ranked at 33. The good news, The Pirates of the Palouse made its way into top 25, coming in at No. 25. And College Game Day is tripping, finally after all of the flag waving, to Pullman for next week’s game of Cougars versus the Ducks. And USC sits at No. 28 with an excellent chance to run the table before it faces No. 4 Notre Dame. 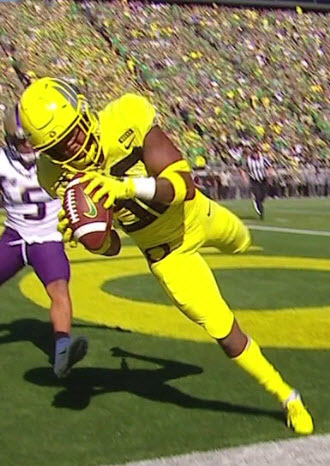 IF, a very big IF, both Oregon and USC can run the table and play for the Pac 12 Championship at 10-2 and 11-1, a Ducks Final 4 appearance is not out of the question. Let us not forget that last week, UW was but one of four top 10 teams that decided to plant face in earth. Of course, when the Grapevine Gurus gather, the Enlightened 13’s methodology is anyone’s best guess. We only need to look back to 2017 to see how strictly the BCS x 2 selection committee adhered to two of its four stated criteria: SOS and Conference Championships. Big 10 Conference Champ Ohio State played USC in the Rose Bowl game in Dallas? The Buckeyes by the way, had a better season ending SOS than an Alabama team that could not win its own SEC West Division. Bill Hancock and optometrists everywhere were thrilled when Bama Tua’d UGA and justified the committee’s selection that was based only on Saint Nick’s annual Mulligan and The Eye Test. If this is what we are going to get out of the Grapevine Gurus why not simply use the AP Poll? But when all is said and done, is any Ducks fan going to quack about spending New Year’s Day in Pasadena? May you be as Blessed as CJ and as Lucky as a home fan watching the visitor’s walk off field goal drift wide right.